Great price for a fully featured security cam kit. 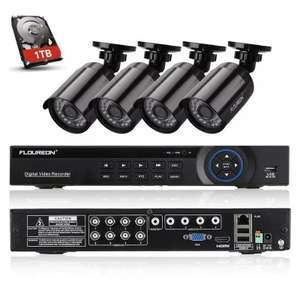 4 Cameras included, with support for up to 8 channels. 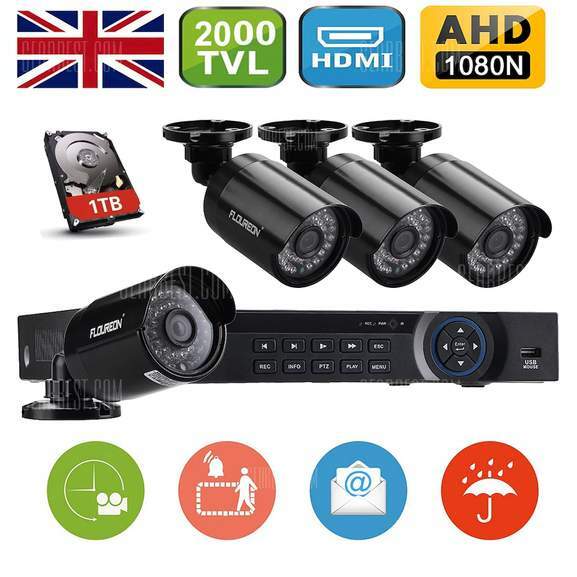 - Setup a CCTV DVR security system to protect your home,shop and office. Am I right in thinking cam can be set up wirelessly? Says linked by internet?Am I right in thinking cam can be set up …Says linked by internet?Am I right in thinking cam can be set up wirelessly? Things like this need to be reliable as you don't want to be up ladders trying to find the fault and eventually ripping it all out. I personally think up to £30 is a worthwhile risk with china company's but not on things like this. Good find but not sure how good these would be. Danger of plugs blowing up! Having spent a lot of time pontificating on how to get power to two cameras I bought to use with ZoneMinder I've come to the conclusion that a system with power over ethernet is the best way to go. Wired... Need to run power and video cable to each one. Normally I would agree with this logic, but in this case the reviews and the YouTube videos appear to suggest these are OK, and whilst I would be worried if they were £100 or so, I think for £30-50 they are worth a punt. One of my neighbours has just paid to have some CCTV installed and it cost well over £500 for two cameras and being honest it doesn't look a million miles away from one of these kits!! If it were PoE I'd be over it, however given the reviews, price and video demonstrated, I think it'll be rude not to join in on the party. Is Gearbest's "EU-17" warehouse actually located in the UK? Some other chinese retailers I've used have what they call UK warehouses located in China, so the goods are still subject to customs and handling charges if checked by customs. Good kit for the price, voted hot. I have a few Floureon cameras ( PTZ, POE, 18x zoom) on an Annke NVR and been very happy with them. One thing to keep in mind if you want to invest in a CCTV system is that it should be future proof. This one I think, is at the end of its life (technology wise), hence the cheap price. While it's a good deal now, you may find out in a few years that you have to rerun all the cables if you want to upgrade to a newer technology ( POE, ONVIF compatible, etc). Most cctv cameras are poor that's why they use old tech descriptions to bamboozle the customers. Frankly , cctv is so boring that you only look at it after an incident , the interface allows this. I got a 4 cam cheap set sub-£50 ebay a few months ago and I'm really impressed. As already mentioned the deterrent effect is the best point of cctv and 4 cams are 4 cams. What length are the cables from Cameras to DVR? Are the cameras powered from the DVR? Normally I would agree with this logic, but in this case the reviews and …Normally I would agree with this logic, but in this case the reviews and the YouTube videos appear to suggest these are OK, and whilst I would be worried if they were £100 or so, I think for £30-50 they are worth a punt.One of my neighbours has just paid to have some CCTV installed and it cost well over £500 for two cameras and being honest it doesn't look a million miles away from one of these kits!! It depends on how much hassle you wish to endure vs your DIY and technical ability vs your budget etc. Many Hikvision installers for instance guarantee their kit for 3 years, these are rock solid for reliability and quality and will probably last at least 5 years if not longer, but you'd probably spend around £600 for a 2 camera 2MP POE system or £800ish for 4 cameras, installed with 1TB DVR; a bit more for an NVR and/or 4MP cameras. On the other hand a 4 camera analogue HD system like this will come in under £100 if you install it yourself. You will have to accept that these are built to a budget, with almost non existent support. You WILL have intermittent issues with the App not working specially when outside of the home WiFi network (reported in multiple reviews of this system), cameras breaking down and your needing to go up ladders etc BUT even if you need to install a whole new system every two years it will be half the cost of a pro installation long term.